I had another brief character encounter the other day. 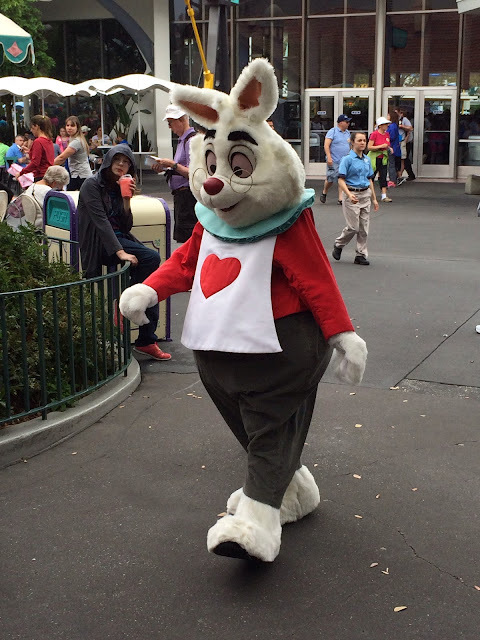 While standing near the restrooms by the Cheshire Cafe, the White Rabbit came walking right by. He greets guests with Alice near the Mad Tea Party in Fantasyland. When it's time for a break, he heads backstage next to these restrooms. 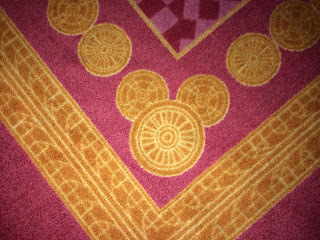 Most Walt Disney World resorts have "hidden Mickeys" located somewhere in the decor. This is especially true of the newest hotels. We were walking through the Cars section of the Art of Animation resort a few nights ago, when I looked down at the carpet and noticed this classic Mickey made out of wheels. There were many of these located throughout the hallways of this building. 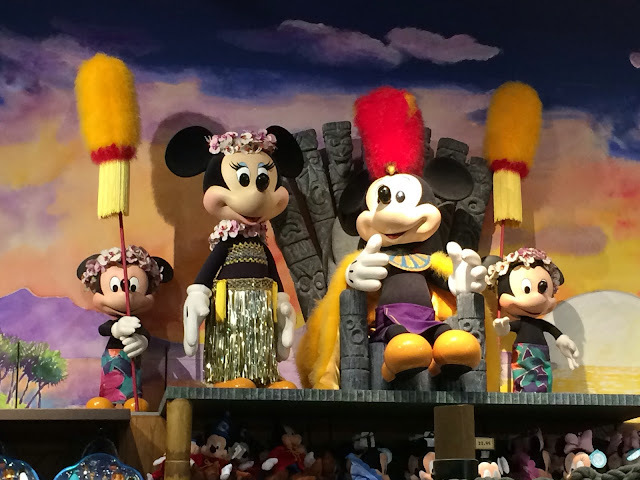 While waiting for my tour guests at the Polynesian this morning, I found myself walking through Trader Jack's, the resort's main gift shop. I noticed these figures high up on a display shelf. 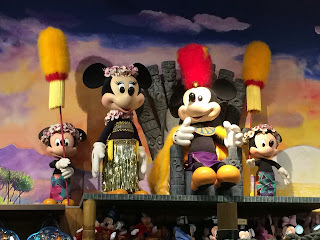 Mickey and Minnie's' heads moved back and forth, as if they were watching over the store. I'm sure they've been there for a while, but I hadn't noticed these famous mice until today. So I was sitting on a bench outside of Lights, Motors, Action today and I saw a very interesting assortment of characters walk by. They are part of a brief meet and greet opportunity that happens in the Streets of America section of Hollywood Studios on most afternoons. This is never listed in the "times guide" and often times guests have the chance to meet rarely seen characters. 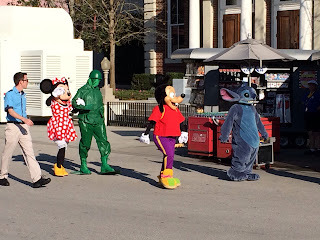 It isn't often that you can take one photo that contains a green army man, Minnie Mouse, Stitch, and Goofy's son, Max! Today I gave a tour at Epcot, and I brought my guests to Mexico shortly after World Showcase opened. 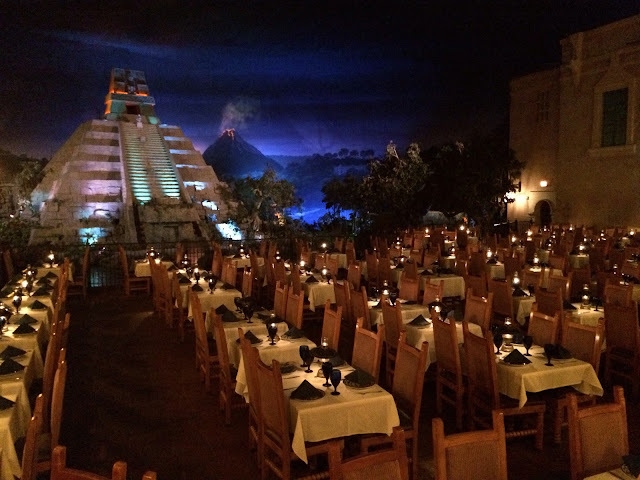 After they boarded their boat on the Gran Fiesta Tour, I found myself standing near the entrance to the San Angel Inn restaurant. I thought it made for a good photo, before any guests arrived for lunch. Mickey's' Philharmagic is a popular 3D movie in the middle of Fantasyland. It has been there since 2003. Prior to this movie, a stage show called Legend of the Lion King occupied this theater. That show closed on this day, February 23rd, in 2002. It was one of Disney's longest running shows, with over 75,000 performances. 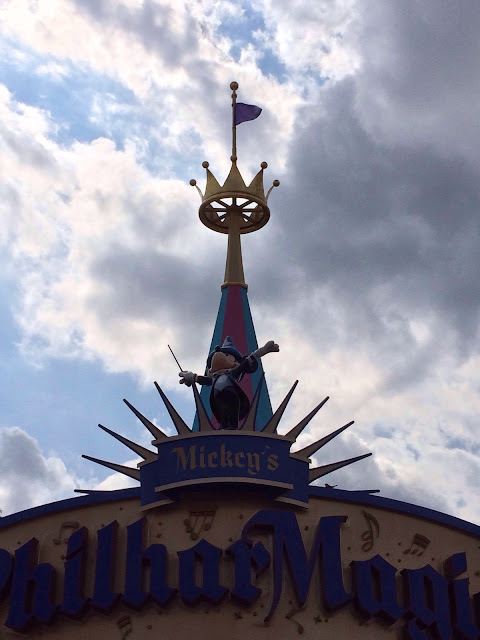 I took this photo today, while giving a tour of the Magic Kingdom. The other day I was walking through Adventureland with my tour guests and Rafiki came scampering by. 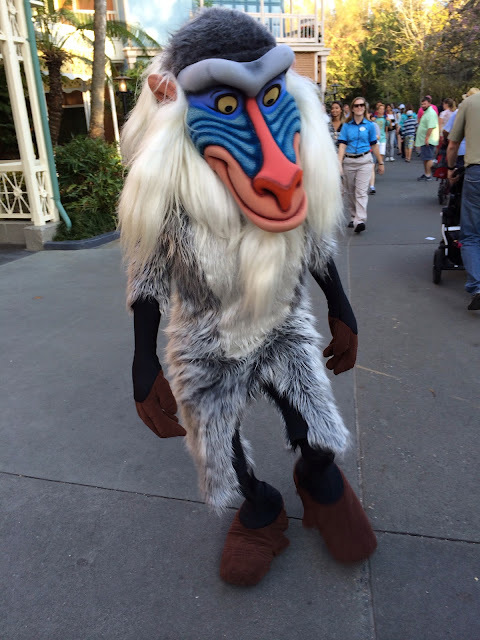 I can't remember seeing him in the Magic Kingdom recently, and he isn't listed in the character section of the "times guide." He came right up to the little girl I was touring with and blew her a kiss. It was a cute and unexpected encounter. Yesterday morning, I was at the Grand Floridian to meet my tour guests. As I was walking from my car to the main lobby, I saw the sun illuminating the Big Pine Key building. This was one of those views that looked like a painting, and I couldn't resist snapping this shot. 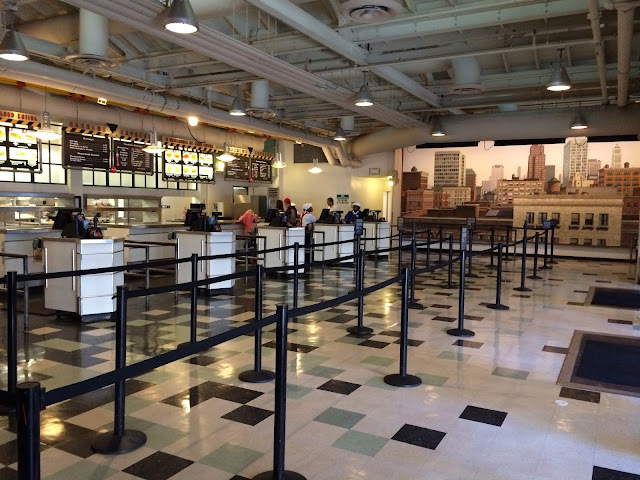 Casey's Corner has been undergoing a major refurbishment over the last six weeks. 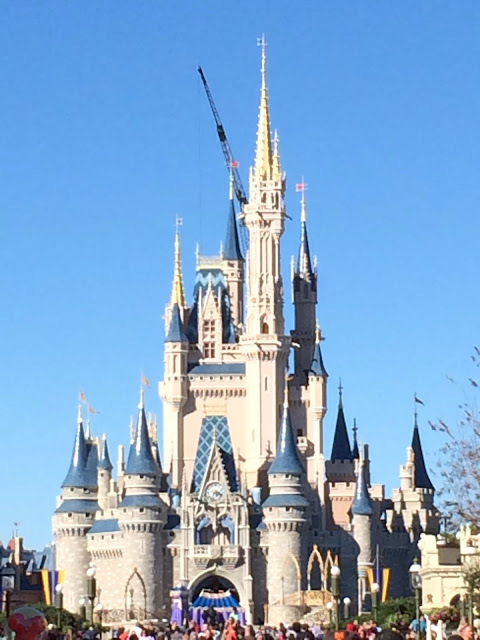 It just reopened, and I was able to take this shot today after giving a tour at the Magic Kingdom. You can see that the seating has been greatly expanded and the "bleachers" and movie screen have been removed. However, it looks like the large blank wall on the left isn't quite finished, and there is room for another big screen. 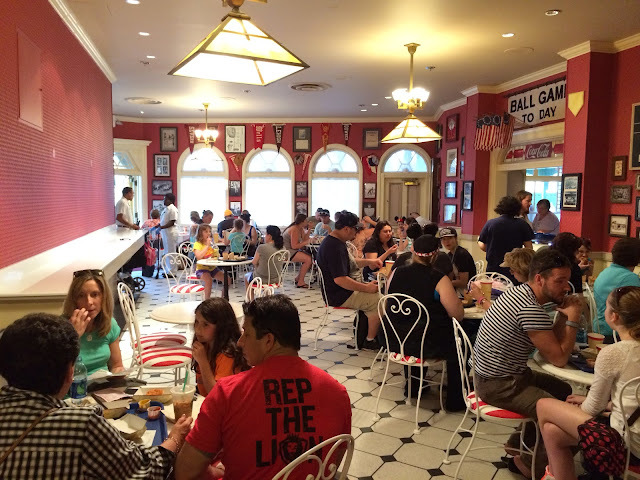 Although it looks like some of the old charm may be gone, the added seating is definitely a welcome addition! The Backlot Express at Hollywood Studios is one of my favorite Disney World quick service restaurants, for several reasons. First, this spot has some of the most detailed dining areas on property. It is themed to "backstage" areas that you might find on a movie set. There are literally thousands of props all over the restaurant. The other reason I enjoy eating here is because I like the grilled turkey sandwich! I took this shot of the food service area this afternoon. Innoventions is a pair of huge buildings at Epcot that house everything from hands on exhibits, to character greetings, to restaurants, and more. 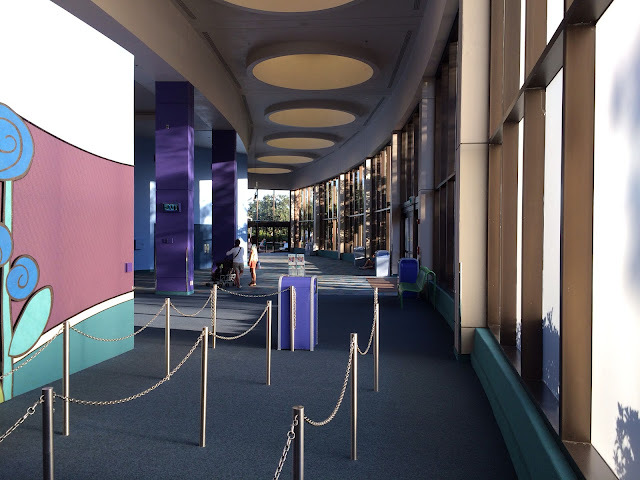 However, there is one gigantic hall in Innoventions West that is basically just open space. It's a good place to take cover on a rainy day and also a shortcut to other pavilions. I took this shot today from the area near the queue of the Epcot Character Spot. The Epcot Flower and Garden Festival starts on March 5th this year, but preparation for this annual event is well underway. It is interesting to see how Disney turns this park into a colorful showplace of flowers, plants, and even butterflies. 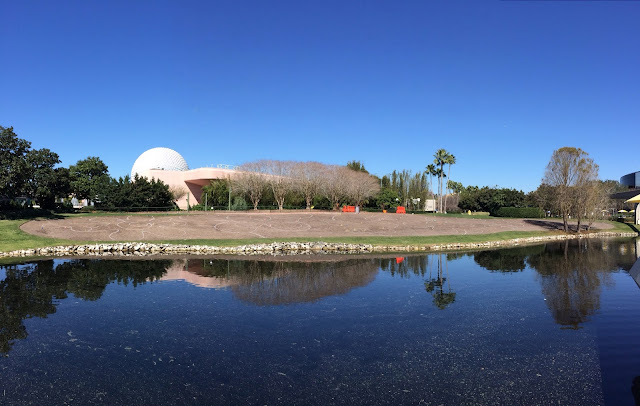 Today, I took this panorama of the large grassy area on the east side of the walkway between Future World and World Showcase. If you zoom in, you can see the outlines where flower beds will be placed to create giant objects in the soil. I always enjoy those chance encounters with some of my favorite Disney characters. 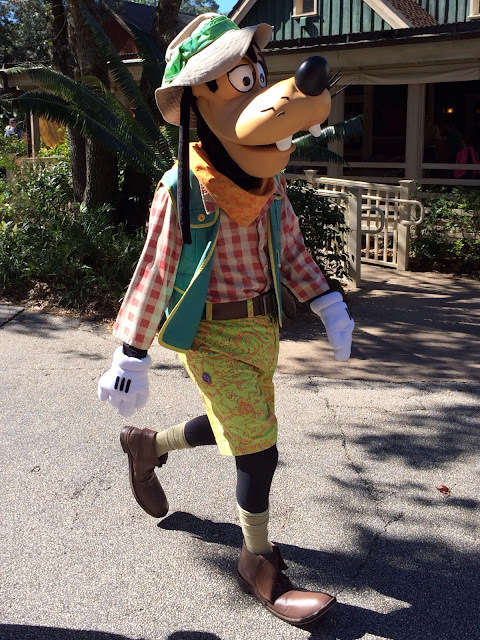 As I was walking through Dinoland today, the Animal Kingdom version of Goofy walked right in front of me. I couldn't resist grabbing my phone and snapping this shot. 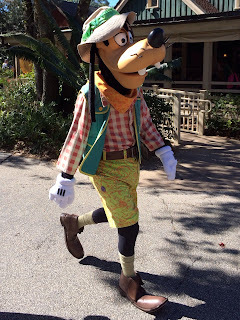 Goofy has always been one of my favorites! Today we celebrate the 64th anniversary of the movie Cinderella, which was released on February 15th, 1950. Of course I had to take a photo of her castle while at the Magic Kingdom today. Also on this day, in 1999, the Magic Kingdom celebrated it's 10,000th day of operation. Fire Chief Smokey Miller is one of the "citizens of Main Street" at the Magic Kingdom. He has been a fixture there for years. Smokey is a friendly cast member who loves to interact with guests. This morning he even led the welcome show to open the Magic Kingdom. 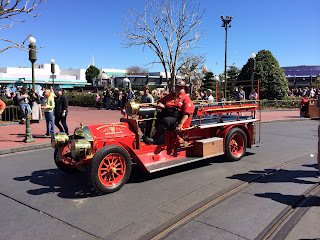 I took this shot this afternoon as he was driving around the hub in his fire engine. There are so many fun things to do at Walt Disney World in addition to the normal theme park experience. This morning I witnessed one of those things taking place right in the World Showcase Lagoon at Epcot. 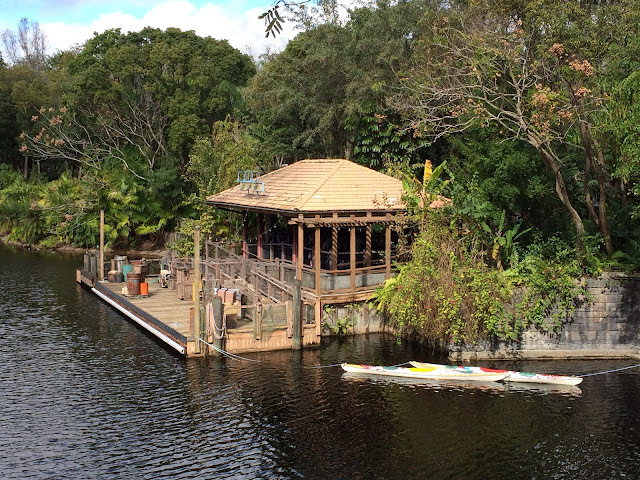 There are several spots on property where Disney offers fishing excursions, and this is one of them. 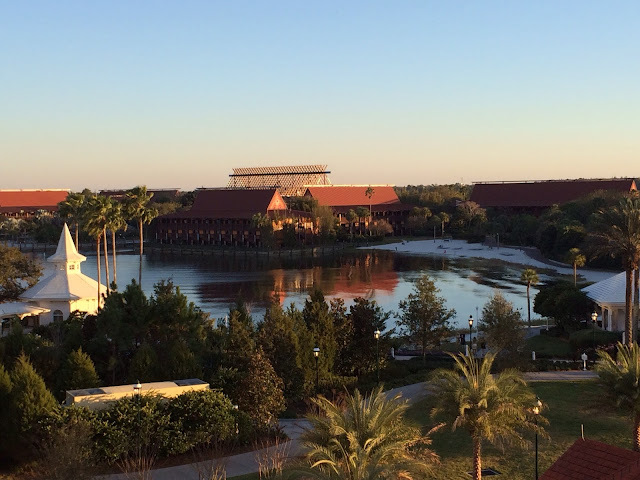 It looked like these guests were enjoying their time on the lagoon. You can see Norway and China in the background of this shot. Today we say happy 96th birthday to Blaine Gibson. Blaine is an amazingly talented Disney artist who is known for sculpting all of the presidents in The Hall of Presidents, except for Barack Obama. I thought it fitting to post a photo of one of his most famous creations, the "Partners" statue. 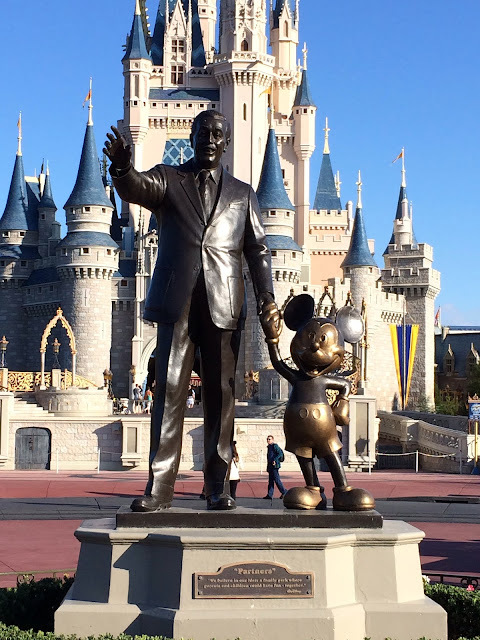 I took this shot this morning, shortly after the Magic Kingdom opened. 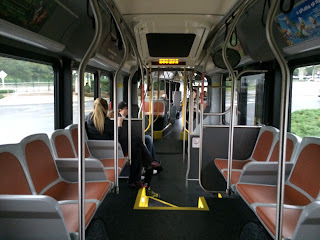 I had the chance to ride one of the new articulated Disney busses last week. These double length, "bendy" buses have recently been added to some of the high capacity routes like the Magic Kingdom to the value resorts. These very long versions can hold about 40% more guests than their single counterparts. If you look closely, you can see that we were in a slight turn when I snapped this shot. 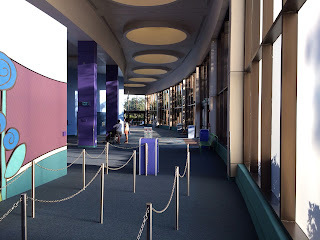 A few days ago, I was in the area of Tomorrowland Speedway shortly after the Magic Kingdom opened. It was interesting to see how they brought the cars onto the track at the beginning of the day. 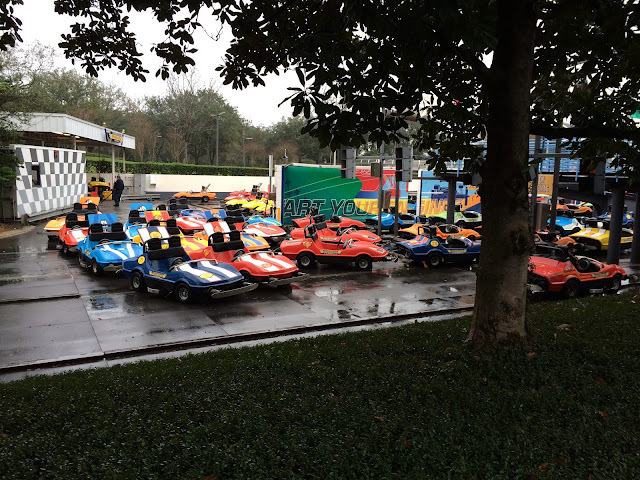 They start with just a few cars stationed in the first lane waiting for guests. Cast members slowly drive more cars into position as guests continue to arrive. It typically takes several hours before all the cars in all four lanes are up and running. This picture shows how the cars are "staged" at opening time. 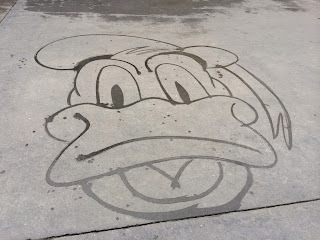 There are some amazing artists walking around Walt Disney World who are disguised as custodial cast members. 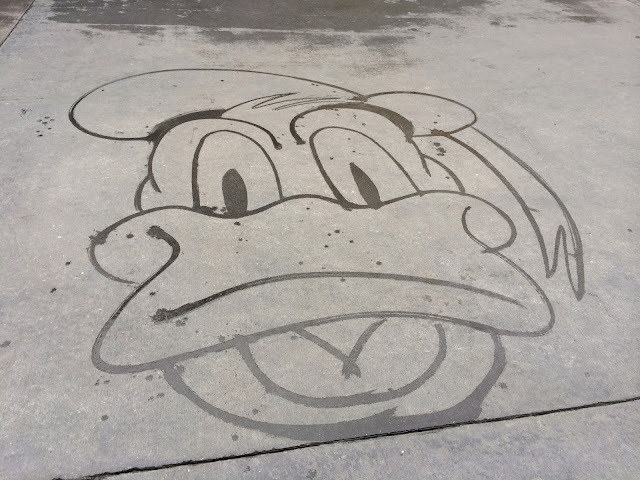 They use water as their paint and a custodial broom as their brush to make Disney characters appear on the streets and sidewalks of the parks. I nearly stepped on Donald's head yesterday as I was walking through Town Square in the Magic Kingdom. I stopped and admired this "painting" while the cast member stood nearby with an appreciative grin on his face. Yesterday, February 6th, marks the birthday of Walt Disney's father, Elias. He was born in 1859 in Ontario, Canada. Like many others in the Disney family, as well as important figures in the Disney company, there is a tribute to Elias in a window on Main Street. 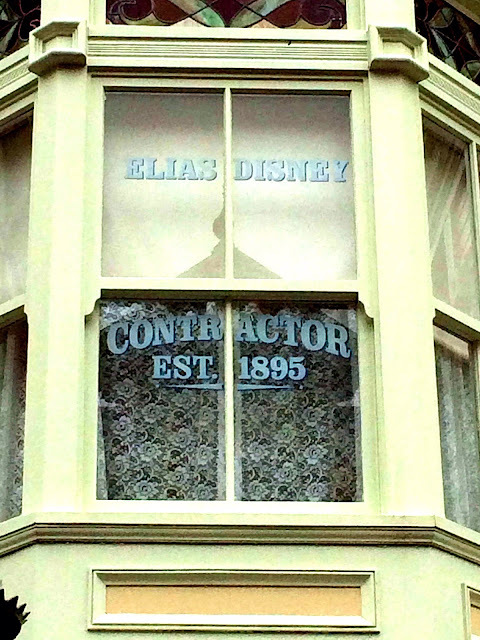 It is actually on "Center Street" and it makes reference to the fact that Elias was a general contractor who opened his own contracting office in 1895. This is just another fun detail that most guests never notice. 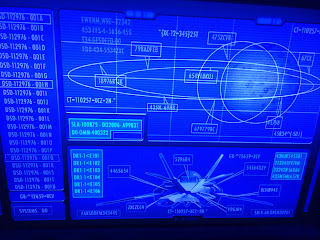 This on-ride photo comes from the "control panel" that is found in front of each guest as they ride Mission Space at Epcot. 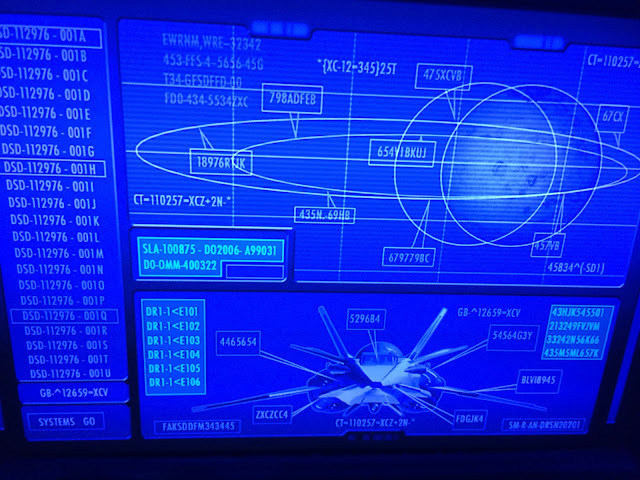 This is one of the most interactive and immersive flight simulators to be found in a theme park. There are so many knobs and switches for guests to touch, and some of them even trigger sounds. I took this shot while riding with my son last weekend. 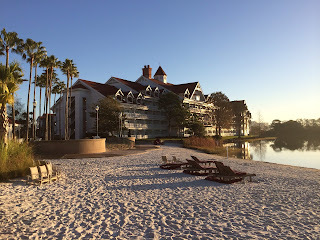 Here is another photo from our stay at the Grand Floridian from two weekends ago. This was the view from the balcony of our 5th floor villa. 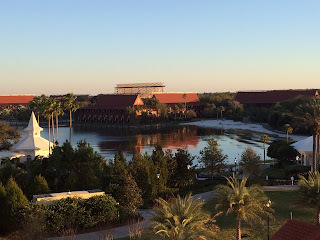 You can see the Wedding Pavilion to the left and the Polynesian Resort in the center. Just out of view to the right was the monorail track. It was fun to sit on the balcony and watch the monorails go by every few minutes. I have to say another big thank you to my friends the Newmans for giving us the opportunity to enjoy a night there! This morning I was able to take one of those rare photos of an Epcot pavilion without any people in the area. I was doing some tour research in Future World and decided to head into World Showcase for "rope drop" near France. After walking by Morocco, I realized I was the first guest in the area of Japan, so I had to snap this quick picture. 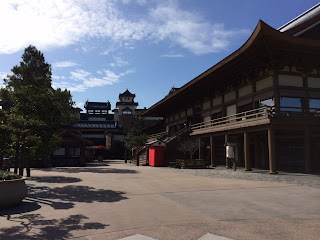 You don't often get an opportunity to see a popular spot in Walt Disney World so quiet! Yesterday afternoon, my son and I took a ride over to the Walt Disney World Speedway. We hadn't been there since they added the "Exotic Driving Experience." 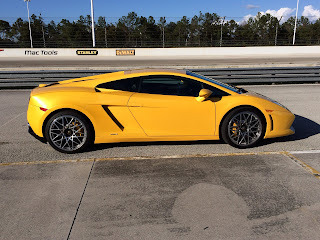 In addition to the Nascar driving lessons and ride-alongs, they also let guests get behind the wheel of some of the world's most amazing cars, such as Ferraris and Porches. Here is another example of a unique activity that can be found outside of the theme parks at Walt Disney World. 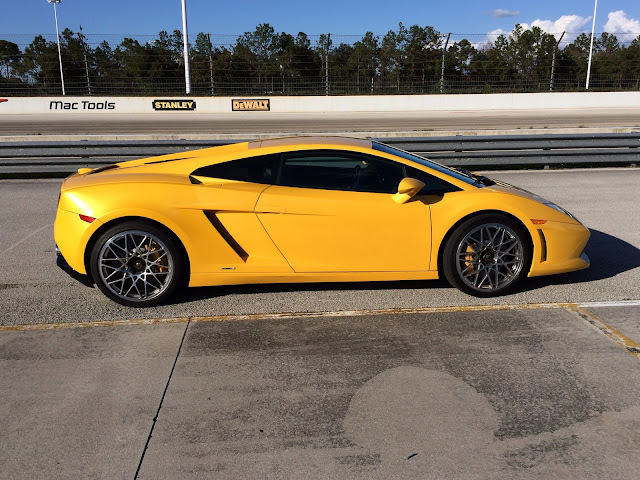 This Lamborghini Gallardo is one of the exotic cars that guests can drive. It does 0-60 mph in about 3.5 seconds and is valued at over $220,000! I'm not sure that I'd feel comfortable driving a car that is worth more than my house! As I've mentioned so many times, there are countless activities at Walt Disney World that don't necessarily take place inside the parks. 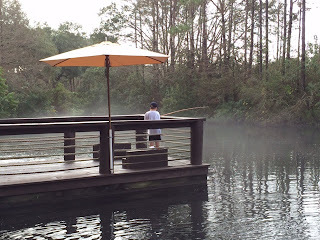 Today, my son and I tried fishing at the Port Orleans Riverside resort. 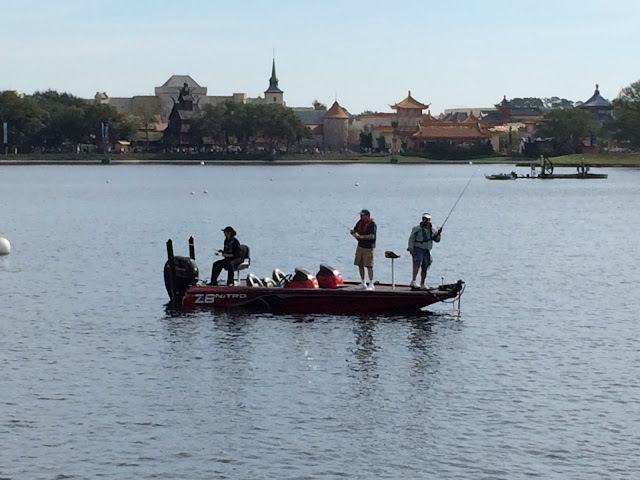 This is one of two locations on Disney property that offer pole rentals and bait. 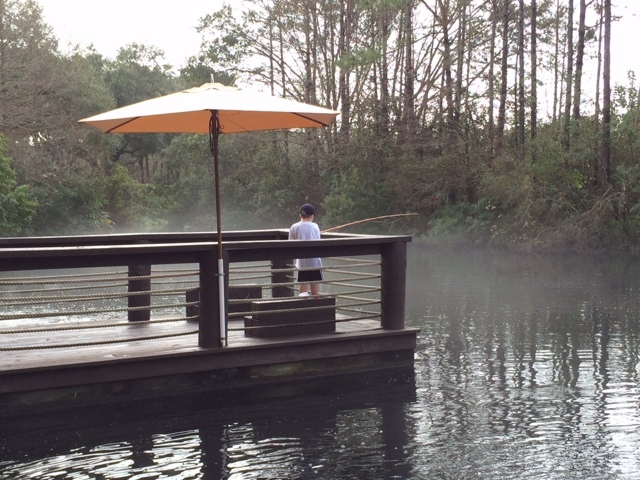 Unfortunately, the fish weren't biting this morning, but we still enjoyed some nice father/son time. In 2013, Disney started a massive construction project to expand Downtown Disney into a bigger and better shopping, dining, and entertainment district, which will be known as Disney Springs. 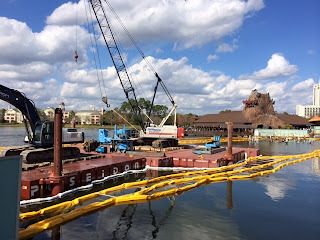 As part of the project, they are building a bridge that will connect the Marketplace with the area that was known as Pleasure Island. They have just started laying the groundwork for the bridge, and it was interesting to see construction workers paddling rowboats around the "lagoon." I took this shot on Tuesday, shortly before enjoying a birthday Margarita.